The "Other" quality of transitional states of decay outside our comprehension is something we respond to with practiced familiarity. It is the sensation repeated over and over in every horror movie: the experience of the transformative power of decay on the living. Without this sensation an entire city block of contemporary culture would instantaneously evaporate. There is nothing frightening, for instance, about zombies whose bodies consist only of reanimated ash and bone fragments. As in: "Night of the Living Nitrogen Rich Soil!" It is that in-between state of decay we continue to return to with compulsive, insatiable fascination, and Jensen seems to operate wholly in an in-between state of her own. Not between life and death, as in a Zombie movie, but rather between simulation and representation. This is the gap we fall into when trying to interpret Jensen's work. Her "Haystack" photographs utterly bore and perplex as representations (as noted in comments, which I agree with) but they are not only representations, they are simulations. It is the discord between these two systems of meaning which gives these photographs interest. As representation, there is barely anything worth looking at, and as simulation, they are indeed poor homage to the romance of the first plein-air paintings. The photographs themselves, in occupying these two systems of meaning simultaneously become complicated metamorphic objects in a state of transitory decay. They are neither good simulations nor good representations, instead they exist in a third completely obfuscated state, pulling meaning from both representational and simulated systems and destroying it; rendering it as null as the obscured features of the person beneath the hood. The haystack photographs are machines for attracting and destroying meaning from the currents of two separate systems. 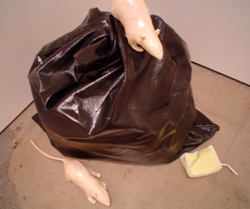 In her trash bag with rats, Jensen adopts the imagery of decay outright. This sculpture operates similarly to the photographs; it exists in a decayed state between simulation and representation. As a representation, it is cleverly made and compelling. It immediately triggers a visual joke. It's funny to see a bag full of trash with rats crawling over it in the gallery. Sometimes it's easy to dismiss art that uses humor, but humor always represents a complex and unusual network of associations. That's what jokes are, really, unusual ideas we hadn't thought of. Jensen's exclusive use of canvas and paint in this piece points us to its function as a simulation. It is as if this sculpture was once a painting. It is similar to the response to Oldenburg's ghost sculptures, we think of them as having once been real objects which have become soft and sexualized after being pushed out of the real into the ephemeral. Similarily, we think of Jensen's sculpture as having once been a painting! Something beautiful, conveying perhaps some universal truth of the human experience, or perhaps a poetic abstract color harmony. But the object in that state had required too much energy to sustain itself, its core shrunk, it emitted excess art electrons into the background radiation and collapsed into something lower. It became a visual joke, a one-off based on clever representation. "Look, rats and garbage in the gallery, that's funny!" 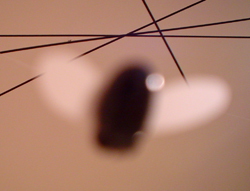 But in fact, just the use of canvas hints at the object's capacity for simulation as well as representation. As in the photographs, this simulation is not even well formed, but in its tenuousness it draws attention to itself, exposes itself. This is the good will of Jensen's work: liberation in decay. She shows the viewer all the cards. She courageously shrugs off the smokescreen of the artist's mastery and instead gives the viewer insight into her own deliberations. She makes the difficulties of her own practice transparent to the viewer. We are privy to the big questions every artist has to face down whenever they enter their studio: Is art real? Does art matter? Instead of being presented with a tidy solution, Jensen presents us with that conflict: we are asked to participate. Jensen's bronze stalagmite seems to almost be an accidental product of the process of bronze casting. This is another product of Jensen's aesthetic of decay. What appears to be a random accidental bronze pour is instead exhibited as a sculpture. Jensen's pigeon sculptures create recursive park monuments: when installed outdoors, one could easily imagine real pigeons roosting on them. This recursion is especially funny when you imagine her stack of pigeons as a model for an outdoor monument. Would real pigeons continue to stack up on top of it to roost? This pillar represents a strange and pointless re-ordering of nature, an attempt to impose reason on the experience of pigeons. Assembling pigeons into architecture as an artist seems at least as pointless as actually being a pigeon. 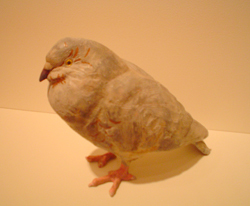 Her single bronze pigeon, exquisitely modeled, is perhaps the best simulation/ representation in the show. As a simulation, it ludicrously engages the symbolic core of "pigeon-ness" just as our bronze statues of pioneers trekking to Oregon communicate universal human principles which we identify through clearly readable symbols, for instance: staring upwards and pointing at something far away seems to symbolize visionary courage. However, it is difficult to discern what the symbolic aspects of "pigeon-ness" might be: we have developed no lexicon of pigeon gestures from which to read. In observing the sculpture, we see that the pigeon simply crouches on the pedestal, one of its feet injured in an unknowable event from its life. It is unreadable. The drama memorialized does not exist. It is perhaps a memorial to the impossibility of drama or symbolism in the life of a pigeon. As a representation, it happens to be an excellent likeness, one might even say "a portrait." But of course the goal of portraiture is the representation of the individual, the dramatization of an identifying personality, and we know that pigeons do not have personalities which individuate them from one another. As before, if we practice anthropomorphism, we must also acknowledge the dangerous converse of zoomorphism. Perhaps all of portraiture is as futile. Perhaps our personalities are carefully constructed simulations of individuation, stupid denials of our utter homogeneity as a species. As a personal aside: Jensen's fly mobile is one of the funniest works of art I have ever seen. I laughed so hard red wine almost came out of my nose. It was just such an incredible sight-gag at the opening. The sculpture itself is so subtle that it takes a long time to see it, when you finally discern it through the glare of the gallery lights, the illusion it creates is very convincing. It looks as though, amidst all the first-Thursday-best ensembles, amidst all the wine sipping and convivial and animated intellectual debate, flies have gathered attracted by the stench! This idea is funny and liberating. It ridicules the high culture of art and suggests the possibility of the decay of the materialism of that culture. Actually, exchanging money for art represents a kind of decay. Money, material power, decays into something more complicated in which value is not easily discernable; something like: beauty or thought or emotion. An art object has material presence of course, but it is valued because it also has immaterial presence. Anything which moves from the material to the immaterial can be thought of as undergoing decay. This is a good description of the paradox of artistic practice which Jensen reveals to the viewer: the conscious construction of systems of decay. 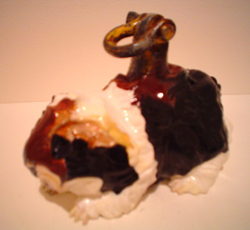 Jensen's guinea pig/ wreaking ball is the most comprehensive summary of her ideological position as an artist. I would call it her emblematic piece. It seems to symbolize everything in her work on the whole. First, it is an excellent representation of a guinea pig. Second, it exposes itself as a simulation of a sculpture by drawing attention to the weight and indestructibility of the material. Guinea pig / wreaking ball operates in that same in-between realm of an object decaying from representation to simulation and yet not quite existing as either. Jensen substitutes artistic mastery for humor as the galvanizing force. This piece is very funny. A guinea pig seems very vulnerable and must be lavished with care, but a simulation / representation of a guinea pig is nearly indestructible. It is ridiculous that the simulation should be more physically significant, more real than the animal itself. It is the good will of Jensen's practice that allows us to see the paradox and the problems of making art rather than present us with a flawless and impenetrable illusion. As it turns out, any bronze sculptures (especially Degas' ballerinas) would make great wreaking balls no matter how delicate or ethereal the subject matter. Isaac and I had a MySpace discussion about Malia Jensen. Yeah, you heard that right. A MySpace Discussion. Am I the only person in all of Portland that was rather uninspired and could really care less about Malia Jensen's show? It just seemed rather unfocused and there was nothing that extended beyond mediocrity for me. Atleast I am appreciated by Isaac. Am I completely off in left field, or is anyone out there with me? You may be right about the mediocrity and uninspiration, but for some reason I just didn't bite the bait. It was an interesting show that's for sure, but I must admit Jeff Jahn is right, the best show of the month is Linda Hutchins. "Degas' sweet ballerina sculptures should not be used as wrecking balls, because they are masterpieces." there must be some argumentative Degas aficionados out there? Have you seen these? they are supposed to be graceful but they seem really de-humanized, and the bodies are bronze but he uses real lace for the tu-tus! They give me the creeping fantods, I've never felt so much revulsion in a museum or felt like my own response to a piece of art was so out of line with the art-historical thinking and common taste. "I find the idea of re-animated nitrogen rich soil incredibly terrifying."